Malibu Pointe is a luxury rental condo resort located in the Crescent Beach section of North Myrtle Beach, South Carolina. The beautiful resort, with its breathtaking ocean and beach views, is located in the second tier, right across the street from the Atlantic Ocean! Walk out onto your ocean view balcony, and take a deep breath. The invigorating salt breeze will lift all your cares away! Take advantage of that spectacular ocean view from either your balcony, or out the window of your master bedroom. The tropical décor of your luxury rental condo will make you feel like you are on a Caribbean vacation. The spacious kitchen with its granite countertops and stainless steel appliances provides you room to prepare your hard-won local catch, or mix up a batch of tropical smoothies. The bedrooms each have a TV, and wireless Internet is available for your convenience. While relaxing on your balcony is a great way to start your Malibu Pointe day, your vacation is calling you! There are so many things to do at Malibu Pointe, you do not even have to leave your rental condo resort. There is a lovely landscaped pool deck with lounge chairs just waiting to be lounged in. There is a lazy river and kiddie pool to float or splash your vacation away in. Get in a workout in the fitness center, and if you overdo it, you can always soak it away in the hot tub. 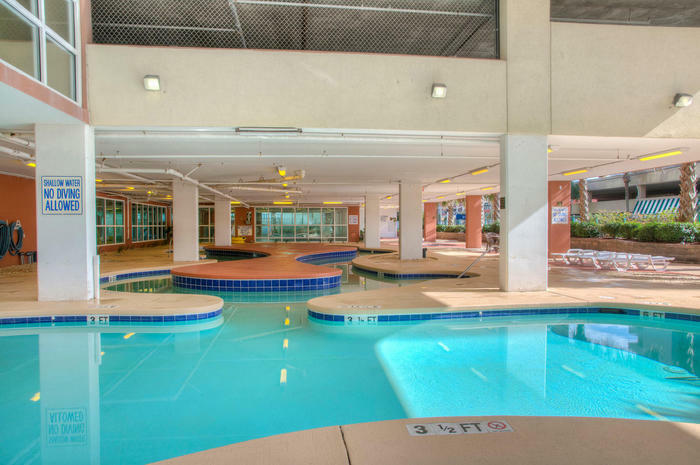 If it is rainy, or you need to shelter from the sun for a while, try out the game room or indoor pool. It can be hard to tear yourself away from Malibu Pointe, but the beach in North Myrtle Beach, South Carolina is not to be missed. Throw on a swimsuit and some flip flops, pack a cooler and a lunch, and head across the street to where the grandeur of the Atlantic Ocean is laid out in front of you. Take a nap on the beach, build a sandcastle, throw around a Frisbee, or go shelling. With all of that water out there you have plenty of choices in activities. So take a swim or wade at the beach, fish off a pier, sailboard or parasail. North Myrtle Beach and Myrtle Beach, South Carolina offer great entertainments year round. Whether it be golfing, fishing, shopping, or dining North Myrtle Beach South Carolina is a hub of vacation activity! Elliott Beach Rentals is not affiliated with onsite management or the HOA of Malibu Pointe.